Matthew McConaughey mines another rich characterization in this offbeat tale of misfortune and glory. It’s sort of a Big Short Lite tale of risky business. Fortunes are won and lost in the mining industry and Gold chronicles an interesting episode involving a businessman and a geologist. All loosely inspired by actual events. Kenny Wells (McConaughey, Dallas Buyers Club) is the businessman, one of small means but buoyed by big dreams. It’s the 1980s and he’s working in his father’s mining business in Reno, Nevada. Prospecting is a business built on risk, a feast or famine proposition that — for Kenny — has hit a financial bottom. Once flush, now dry, Kenny comes upon the story of a geologist searching for gold in Indonesia. That’s Michael Acosta (Edgar Ramirez, Domino). Bonded by way of a classic idealistic contract written and signed on a paper napkin, the two strike out on an adventure of emotional, physical and financial highs and lows. Investors offer up suggestions, partners enter the picture and even the king of Indonesia — and his son — gets embroiled in the controversial undertaking. It’s an interesting tale to follow, smoothly directed by Stephen Gaghan, who helmed the relatively impenetrable story of Syriana with George Clooney back in 2005. Here, Gaghan has much more accessible material to work with in a screenplay written by frequent collaborators Patrick Massett and John Zinman. They can be thanked — or blamed — for Lara Croft: Tomb Raider (with Angelina Jolie) as well as episodes of Caprica and Friday Night Lights. 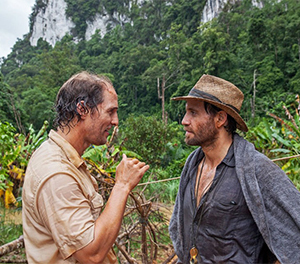 Here, Gaghan has captured McConaughey in one of his best performances. McConaughey’s once again gone all out — gaining quite a belly while sporting a receding hairline and horrendous teeth. He sells the story. Kenny is a business gambler who’s a mix of the sympathetic and the off-putting. Going through a bout of malaria while on a visit to the mining site in Indonesia, Kenny is put through the wringer as he grapples with Mother Nature, Father Time and a mother lode of Uncle Benjamins. Balancing out Kenny’s roller-coaster life is Michael, who remains calm, cool and collected as things start low, then rapidly rise to obscene fortunes. Gold benefits from an obscure story (at least to most Americans) further obfuscated by a change of time and place. Instead of the ‘80s, the bulk of the real action took place in the ‘90s. And instead of being based in the U.S., the business was in Canada. At least Indonesia serves as common ground between Hollywood and Calgary. This telling of the story would’ve benefitted from exploring more of the innocent investors’ lives and how they were devastated by the mining madness. Even so, amid the heartbreak of fortunes lost, there’s fun to be had from the safe vantage point of the theatre seat as the truth behind the mine is revealed and the innocence or guilt of those involved is brought to the light. At least somewhat.